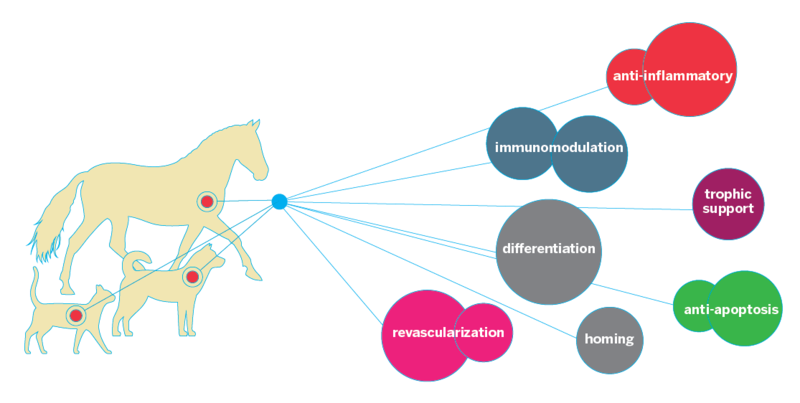 What is VetStem Regenerative Medicine? is a broad definition for innovative medical therapies that will enable the body to repair, replace, restore, and regenerate damaged or diseased tissues. uses a concentrated form of autologous adipose-derived adult stem cells to treat traumatic and degenerative diseases, including bowed tendons, ligament injuries, osteoarthritis, and osteochondral defects in horses, dogs, and cats. Despite its relative infancy, regenerative medicine is not new. Success in numerous animal models of disease and emerging success in human clinical trials for Crohn's fistulas1 and stroke,2 along with hundreds of ongoing clinical trials (see sidebar) support the rationale for stem cell use, and now success, in veterinary medicine. VetStem collaborative and clinical research demonstrate positive results in treating horses with tendon and ligament injuries, osteochondral defects, and osteoarthritis.3-6 The first peer-reviewed double-blinded multicenter study for adipose-derived stem cell therapy use in canine osteoarthritis of the hip showed significant improvement in all post treatment evaluation times for lameness, pain, and range of motion. Similar results have been obtained for canine elbows and stifles. Stem cells are multipotent and can differentiate into tendon, ligament, bone, cartilage, cardiac, nerve, muscle, blood vessels, fat, and liver tissue22,23 (see figure below). The stromal fraction that is harvested from adipose tissue is a heterogeneous mixture of regenerative cells (see below). Why use adipose-derived regenerative cells rather than regenerative cells derived from bone marrow? Apoptosis is defined as a programmed cell death or “cell suicide”, an event that is genetically controlled.35 Under normal conditions, apoptosis determines the lifespan and coordinated removal of cells. Unlike during necrosis, apoptotic cells are typically intact during their removal (phagocytosis).